They lie in the interiors of the continents. Lie in the Westerly wind belt [mid-latitudes or temperate region]. Grasslands are practically treeless due to continentiality [deep within the interiors of the continents where rain bearing winds don’t reach]. In Eurasia, they are called the Steppes, and stretch eastwards from the shores of the Black Sea to the foothills of the Altai Mountains. [2,000 miles long belt]. Climate is continental with extremes of temperature. Temperatures vary greatly between summer and winter. The summers are hot and the winters are cold. Summers are very warm, over 18 – 20° C.
The steppe type of climate in the southern hemisphere is never severe. The average rainfall may be taken as about 45 cm, but this varies according to location from 25 cm to 75 cm. The heaviest rain comes in June and July (late spring and early summer). Most of the winter months have about an 2.5 cm of precipitation, brought by the occasional depressions of the Westerlies and coming in the form of snow. 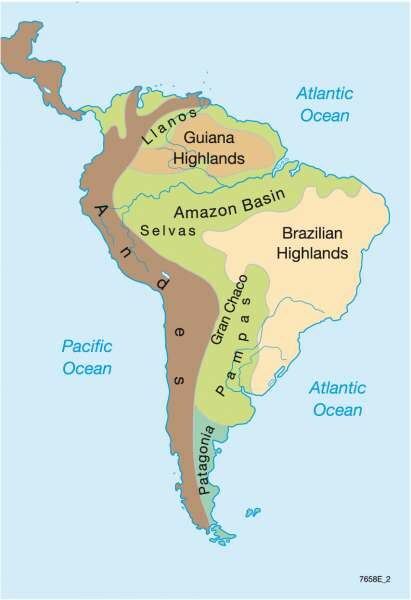 The maritime influence in the southern hemisphere causes more rainfall. On the eastern slopes of the Rockies in Canada and U.S.A. a local wind, similar to the Fohn in Switzerland, called the Chinook, comes in a south-westerly direction to the Prairies and has a considerable effect on the local pastures. It actually comes with the depressions in winter or early spring from the Pacific coast ascending the Rockies and then descending to the Prairies [katabatic wind]. It is a hot wind and may raise the temperature by 5° C within a matter of 20 minutes. It melts the snow-covered pastures and animals can be driven out of doors to graze in the open fields. The agricultural year is thus accelerated. Local farmers welcome the Chinook for frequent. Chinooks [Snow eaters] mean mild winters. Greatest difference from the tropical savanna is that steppes are practically treeless and the grasses are much shorter. Grasses are tall, fresh and nutritious. This is typical of the grass of the wheat-lands in North America, the rich black earth or chernozem areas of Russian Ukraine and the better watered areas of the Asiatic Steppes. Where the rainfall is light or unreliable, or the soil is poor, as in the continental interiors of Asia the short steppe type of grass prevails. The grasses are not only shorter but also wiry [lean, tough] and sparse [thinly dispersed or scattered]. 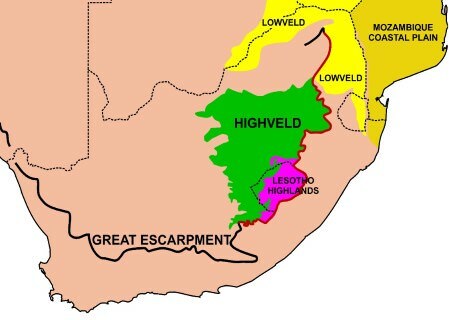 These areas are less suitable for arable farming and are used for some form of ranching as in the High Plains of U.S.A. The growth of grasses is not abruptly checked by summer droughts or winter cold. Polewards, an increase in precipitation gives rise to a transitional zone of wooded steppes where some conifers gradually appear. In the cultivated regions, such as the wheat farms of the Prairies, double rows of trees are planted around the house to shield the occupants from the strong wind. Does not have much animal diversity. 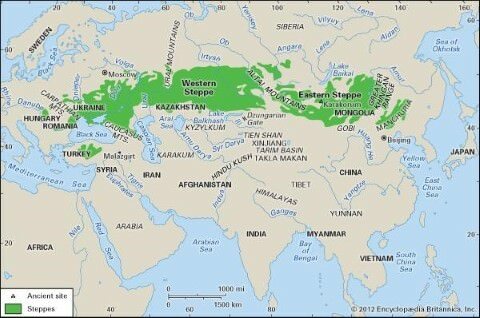 Horses are common in Asian Steppes. Cultivation was unknown just before a century and the region was one of the most sparsely populated parts of the world. In recent years, the grasslands have been ploughed up for extensive, mechanized wheat cultivation and are now the ‘granaries of the world’ [Prairies]. 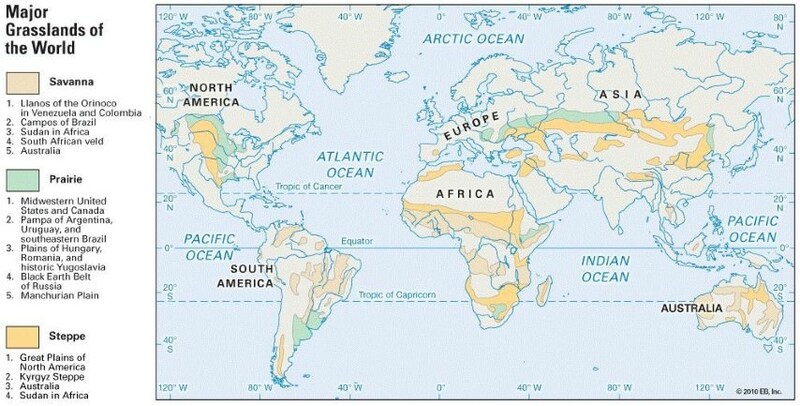 Besides wheat, maize is increasingly cultivated in the warmer and wetter areas. The tufted grasses have been replaced by the more nutritious Lucerne or alfalfa grass for cattle and sheep rearing. These temperate grasslands are now the leading ranching regions of the globe. This type of migratory animal grazing has almost disappeared from the major grasslands. The herders were wandering tribes e.g. the Kirghiz, and the Kazakhs. The harsh environment of the nomads, with long droughts and unreliable showers made the Kirghiz a tough and fearless people, and they long resisted subjugation by the Russians. Now, however, under the Communist regime they are being forced to settle down. The steppes have been made into huge collective farms and state farms for ranching or producing cereals. The temperate grasslands are ideal for extensive wheat cultivation. The level ness of the Steppes and other temperate grasslands all over the world makes ploughing and harvesting a comparatively easy job. In the Prairies, the Argentinian Pampas, the Ukrainian Steppes and the Downs of Australia, agriculture is completely mechanized. The natural conditions suit animal farming. With the development of refrigerated ships in the late nineteenth century, the temperate grasslands became major pastoral regions, exporting large quantities of beef, mutton, wool, hides. Milk, butter, cheese and other dairy products are also important in some parts of the North American grasslands. Countries like Hungary, Ukraine, Romania etc. Pampas Alfalfa: nutrient rich grass. When Chinooks are more frequent in the Prairies, the winters are milder.